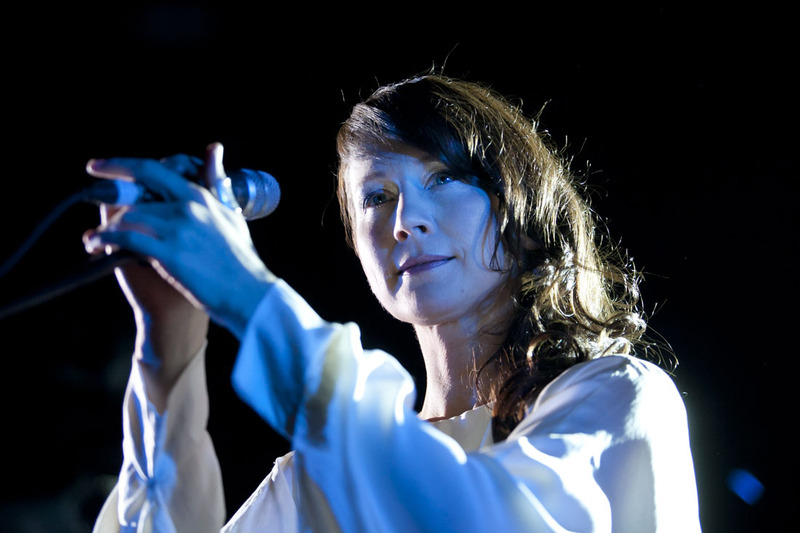 Last Sunday Lamb finished their 2011 tour with a highly anticipated, sold out Budapest gig. During their live act the audience was floating with the ethereally enchanting beauty and rocking on the floor at the same time; a good example of how bands should squeeze the power of their albums on stage. With great enthusiasm and energy Andy Barlow was screaming while jumping on various instruments on stage, and Lou Rhodes enthralled the audience with her intimate voice. There was so much love between Lamb and the fans that the band even gave hugs after what they called “one of the greatest shows we have ever experienced”. Lou Rhodes talked about their present and how they had arrived at the new album ‘5’. What do you think about downtempo, is it something timeless? Is it easy to work in this genre in these days, now that everything is about dubstep? I’m not sure we do work in that genre, or any genre for that matter. Is everything about dubstep? I think there’s some really interesting stuff out there in the post-dubstep movement, people like Baths, Shlohmo, SBTRKT, James Blake, much of which was firing us up while we were making ‘5’. How do you create richness in your music? Any special instrument or method? “Richness” in our music? How would you define that? We don’t think too hard about what makes our music what it is. There’s no specific method or instrument. In fact we try to have as little a formula as we can. It’s just about what happens when the two of us get into the studio. Having said that we did have a kind of ground rule when we started working on ‘5’ that we would keep things raw and stripped sonically and that we’d work quickly, and so avoid over-producing the songs. How have you changed musically after the break? I think there’s more of a meeting in our musical tastes since the break. Before we split in 2004 I was yearning to immerse myself in making acoustic music which I subsequently did with three solo albums. Andy worked on a load of different projects in a production role and made his ‘Lowb’ album. Coming back into working together as Lamb we had a much clearer view of what the essence of the project is and where we’d possibly lost sight of that in the albums we’d made following on from our debut. We realised that our priority was to make music that was raw and honest, a kind of stark dialectic between my voice and songs and Andy’s production with nothing to dilute that in the mix. Was your concept with the new album to look back and evoke the mood of your huge hits from the past, like “Gabriel”, or rather to create something new? No, we had no intention to re-create something along the lines of former songs. We wanted to strip things back to the early intention that had brought Lamb together in the first place and make a record that was fresh and experimental while harking back to this defining ethos. How can you summarize the feedback of the new album so far? It’s been mostly positive I’d say. Many have said it’s our strongest album to date and we’re pretty excited about it. What broke inside you after 2003? Why was the ‘Between Darkness and Wonder’ album such a huge turning point in the band’s carrier? As I said earlier we’d somehow lost sight of the essence of what made Lamb in the first place. We’d decided, for that album, that we’d write with the live band so there were five of us in the studio rather than just Andy and I. In retrospect this was bound to dilute the process but the relationship between the two of us had become pretty tense so I guess we were trying to dilute that dynamic by including others. I found myself writing with Jonny (double bass) and Oddur (guitar) and trying to pull things in an acoustic direction while Andy became more and more frustrated and tried to wrestle the whole thing back in a more technological direction. The album ended up as a compromise for Lamb in a number of ways and, at the end of touring it, there was a feeling we wouldn’t know where to go if we were to write another album. At the time I also urgently wanted to write solo and acoustically and so the band split in 2004. Did you help each other during the solo projects in any way? I recorded my third solo album, ‘One Good Thing’ at Andy’s place, something that I never could have imagined in the past. Initially, when he suggested it, I thought it wouldn’t work as I had only memories of the battleground of ideas our previous studio experiences had been. It became obvious, though, that we’d both changed a lot and, the more we discussed it and hung out listening to music, the more it became a possibility. In the end I made the album I wanted to make with Andy’s technical expertise but with a very clear understanding that it was my project and not ours. At that time Andy asked if I’d work on a song or two for his Lowb album but this collaboration became what was soon to be the new Lamb album. Why have you decided to give Lamb a second chance? Can you remember when you made this decision? We didn’t see each other much for a couple of years after we split. I think we both needed the break. Then, in 2009 we were invited to play a small number of festival shows and thought we’d do them for the hell of it. When we agreed to these shows we had a conversation about how we’d like to do things and we both agreed we wanted to strip the live show back to the original line-up of myself, Andy and Jon Thorne on double bass and rework a lot of the old songs, bringing the production up to date and simplifying and toughening them up. Somehow through this experience a feeling of a new direction for Lamb seemed to emerge and when Andy asked me in a long telephone conversation to give him one good reason why we shouldn’t make a new Lamb album I really couldn’t think of one. We’d always said that Lamb would only make another album if we had something new to say and it seemed that time had come. Are you planning new videos and singles? We released a single in November, ‘Build a Fire’, with a pyromaniac’s dream of a video directed by John Nolan. We’re in the process of deciding on the next single at the moment. Andy produced the Fink album ‘Distance & Time’; is he planning any similar projects? Andy’s been involved in a number of projects as a producer over the last few years including Fink’s ‘Distance & Time’. He’s currently working with a band called Ramona Flowers whose debut album is pencilled for release in the spring.